It’s about time period pieces examined political perspective and its impact on sexuality with more depth. The Invisible Woman is a film that shows the impact of political constraints on relationship with a measured perfection that underlies the subtlety of its subject matter, but it moves deep enough so that these constraints enter the mind and force one to even question the strength of their own feelings. 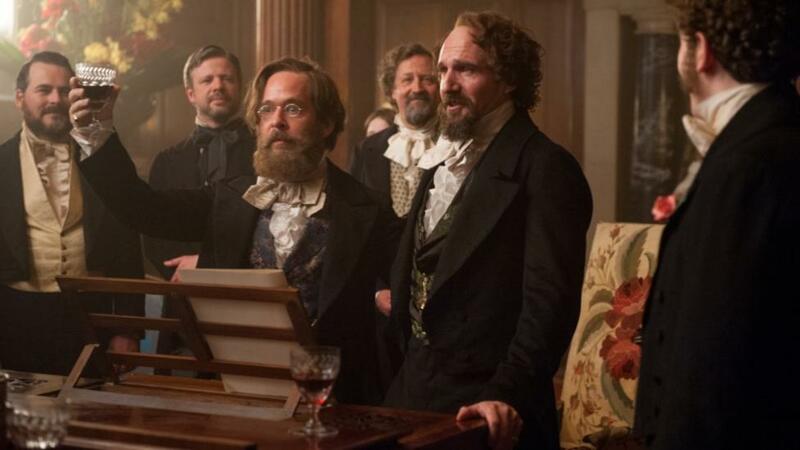 Charles Dickens Ralph Fiennes) was writing at the start of the Enlightenment. He was a man of great stature, deeply loved, wealthy and a little in love with an idea he had of himself as a bohemian, a man of a new age. However, when it came to living out those ideals, when push came to shove he was unable to ignore the conventions of marriage – at least in public. The Invisible Woman is the tale of his lover Nelly (Felicity Jones), set aside in a secret life until she was able to win her freedom (of sorts) with his death. In fact, the details on Nelly’s life are sketchy and so she has been sparsely written due to the burning of letters and papers containing her name and the general secrecy that surrounded her that continued on after her death. Claire Tomlain wrote her story in 1990, mostly from papers released after the death of Dickens’ last child in 1933. Keeping Nelly a secret seemed to be something that was so important, it lasted long after Dickens died. 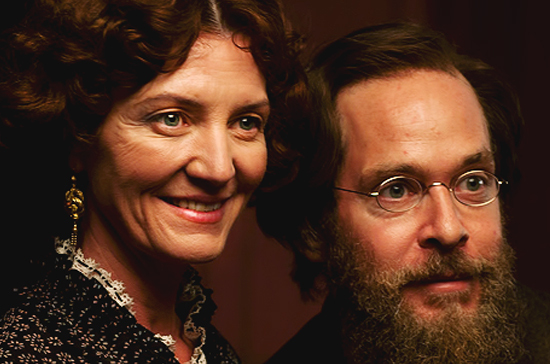 In The Invisible Woman, the ferocity of societies demands lay themselves over Nelly’s mind and as a creative woman who can’t act (the profession of her sisters and mother) the implication of her love affair as a kind of arrangement made to secure her future plays over the top of her genuine feeling for the remarkable Charles Dickens. Love was a luxury the poor could ill afford, and as Nelly realises what is to become of her, we watch her confusion turn to a cold angry acceptance. Felicity Jones plays Nelly with the air of a very intelligent woman forced into a situation that however bad, is the best she can hope for. We know from the outset that she will escape her predicament, but she never clearly states the arrangement with Dickens is one she genuinely wants. She is as enamoured with his brilliance as he is with her youth and beauty but the viewer has the feeling that societal pressures are too great for either to experience the freedom required to fall in love properly. It is this ambiguity that separates The Invisible Woman from other films of its kind, and Fiennes exacerbates this distance between the lovers with closeups of illicit whispering, lips against ears, without passionate embrace. In some ways, Fiennes portrays Charles and Nelly as a couple magnetically drawn to the same place at the same time who do not know what to do once they arrive. The story of Nelly Ternan is one of the sacrifice of the individual for the benefit of the laws of society, an ideal the Enlightenment was decidedly against, and yet with Fiennes clever styling, the love affair is laced with contemporary nuances; Nelly and her mother (Kristin Scott Thomas) imbued with particularly modern characteristics – such as professions and freedoms of movement not normally ascribed to females at the time, and the existence of Wilkie Collins (tom Hollander), his mistress and their child is such a shocking phenomena, Nelly herself struggles with the implications of it. By roving between ages in this way, Fiennes is able to remind us how far we’ve come while equally informing us of how far we still need to go in the struggle for freedom of opportunity for each individual. The transition from book to screen is facilitated by Abi Morgan so successfully, many opportunities have been created and taken advantage of by cinematographer Rob Hardy, who uses wide sweeping shots of hills and beaches to broaden the effect of isolation created around Nelly as she moves closer and closer to her role as Dickens’ secret mistress. Future shots of her racing toward enormous water-logged beaches add to the ambiguity of her choice – is she walking because she loved Dickens’ and misses him, or because she is filled with a distressing sadness brought about by her secret? Nelly is always isolated, even in marriage, the past holding her captive by the dictation of her behaviours in the present. This is posited against Dickens, who in one telling shot from overhead, is always in swarms of people trying to congratulate, talk to and just touch him. Fiennes paints Dickens’ trapped in a different cage, and yet if not equally as confined as Nelly, still trapped just the same. His passion for her is more obvious under Fiennes direction in a telling move, that adds to the contemporary feel. We never properly understand why Nelly is there, and we feel Dickens is asking the same questions in his mind. Period dramas are not usually my favourite film genre, but The Invisible Woman is an intelligent script opening up a story to beautiful greyish cinematography and fine acting under the talented hand of an excellent director. The quizzical subtleties are the films strength, however and make it unique among these sorts of films.